Sunvil has introduced a brand-new luxury Galápagos cruise vessel, MV Theory, to its Latin America programme. MV Theory and its sister ship MV Origin (also offered by Sunvil) are the only two ships in the Galápagos to have been awarded a Relais & Châteaux certification. As such, guests can be guaranteed a very high level of comfort and service while discovering this unique destination onboard the luxurious new small yacht. 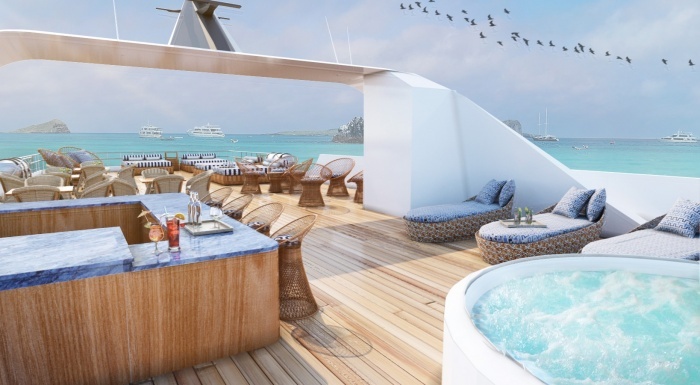 MV Theory will mimic the design of its sister ship, featuring ten deluxe en-suite rooms with panoramic views, sundeck with Jacuzzi and loungers, indoor lounge and bar, small gym, library and more, all topped off with stylish furnishings and useful extras such as air-conditioning and Apple TV. The MV Theory will offer an idyllic way to explore this otherworldly archipelago. Departing from San Cristóbal, guests have the choice between two comprehensive seven-night itineraries: the Southern/Central route or the Western/Northern route, with the option to combine both for the ultimate two-week tour of the islands. Each itinerary highlights the best of the Galápagos, from its striking landscapes to its rich and varied wildlife, bird life and marine creatures.